Poet, author, visual artist, singer, songwriter: these are just a few of the things Patti Smith has been over the years. But even with all her personal accomplishments and accolades, the iconic artist’s recent appearance on Mountain Stage was dedicated entirely to her late husband, Fred “Sonic” Smith. Best known as guitarist of the punk band MC5, Fred passed away in 1994. 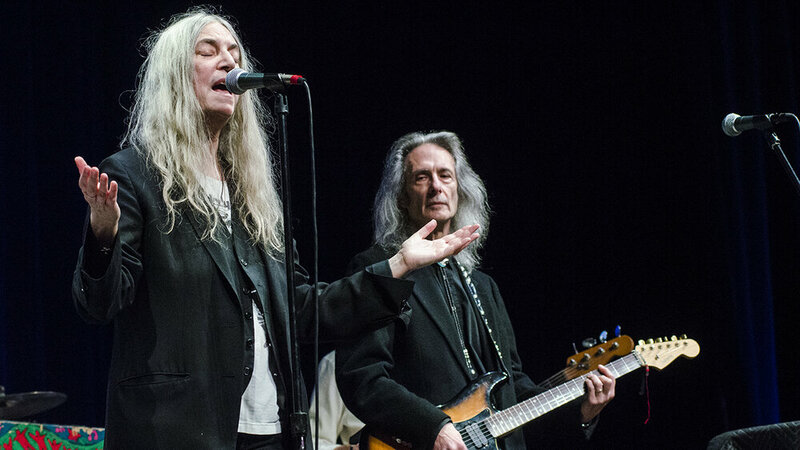 Patti Smith accepted Fred’s posthumous induction into the West Virginia Music Hall of Fame, and honored him by performing some of her songs that have the deepest ties to Fred. Smith was accompanied by her son Jackson on guitar, daughter Jesse on piano, and longtime collaborator Lenny Kaye on guitar, along with members of the Mountain Stage Band. Patti Smith, a South Jersey native, published her latest memoir M Train in 2015. She won the National Book Award for her previous memoir, Just Kids. Her latest album was 2012’s Banga, and she just announced the Steven Sebring documentary Horses: Patti Smith and her Band, capturing the 2015 concerts celebrating the 40th anniversary of her debut album Horses. Listen to Patti Smith’s Mountain Stage performance below via NPR Music.